A day trip to discover one of the most uncontaminated areas of Italy: a long coastline full of bays and beaches wet by a crystal clear sea, and five characteristic and clinging little town. Why we love it: The Cinque Terre has an unique landscape, you will find yourself deep in an uncontaminated nature, among vineyards and sea, in small villages that seem colorful paintings. You will find yourself before unique and breath-taking views, you will feel enchantment in the narrow streets of the five villages among their colorful houses, and you will be inebriated by the fragrance of the sea. This is what is waiting for you along the itinerary by foot in the famous Cinque Terre. The starting point of our trip is Riomaggiore. You can reach the first of the 5 villages in train, in less than 10 minutes from La Spezia, in about an hour and half from Genova. The station is separated with the inner city by a tunnel, that you will find to the right of the exit of the station. At the crossroad you can keep going straight and go down in the underground passage, you will arrive in the pier. Otherwise you can turn left to reach the main street of the town. The colorful village is rather small but magical and charming; move around the alleys and don’t miss the Castle and its romantic and fascinating panoramic roof terrace. To arrive at the second stop of the itinerary, the fastest and most beautiful road is the so called Via dell’Amore (Street of Love), first section of Sentiero Azzurro. The trail is only 1 kilometer long and joins the village of Riomaggiore and Manarola through a beautiful footpath on a cliff face over the sea. Currently, sadly, only a segment of the path, from Manarola, is open, but it’s still worthy. The entire path should be open by April 2017. The alternative way for reach Manarola is the path Via Beccara, slightly more challenging that pass through a hill. It runs for 1,25 kilometer and you need about one hour to pass it. And here you are in the second village of Cinque Terre. According to most of the tourist, this is the most photogenic of the five towns, so grab your camera and immortalize this little corner of heaven. Manarola is famous for its nativity scene that, every year, is inaugurated on the 8th of December and usually close for the end of January. It was inaugurated in 2007; this peculiar and wonderful nativity scene of lights is the biggest in the world! The creator of the event is Mario Andreoli, a local man, that every year arrange more than 300 full-size figure, and about 17 thousands lights, up and down in the terracing of the hill. Furthermore, the nativity scene is totally eco-friendly, in fact it’s sun powered. The wine of Manarola is one of the most exquisite of Liguria, it’s called Sciacchetrà and it’s made only in this area. Look for the Cassola, the roof terrace where the grapes shrivel up in the sun. The outcome is a exquisite dessert wine. To continue the discover of Cinque Terre, there should be the second segment of Sentiero Azzurro that connects Manarola to the train station of Corniglia. This path is also affected by the damages of the flood of 2011, and it will be closed to April 2016. The path passes next to the sea, it’s 2 km long and requires less than an hour. The alternative way is the path n°6, up to Volastra and then the 6d path up to Corniglia. In this way, the distance between the 2 town is 4,5 km. Anyway, you’ll arrive to the train station of Corniglia where a great staircase of 382 steps is waiting for you. If it looks too strenuous for you, don’t worry: the bus in just few minutes will bring you in the inner city! Corniglia is the only one that doesn’t face the sea directly, in fact it’s perched on a 100m high steep cliff. The small village is the least contaminated by the tourism and offers a view that doesn’t have rival. Like in the rest of the area, grapes and olives are grown in the surrounding hills and it’s not strange to run into women walking in the streets with baskets full of fruits of the land on their heads Nearby, you can reach through a tunnel (you’ll need a flashlight) the beautiful beach of Guvano with its crystal clear water and wonderful sea bottom. We continue in the Sentiero Azzurro, the path for Vernazza is 3 km long and it’ the first one that don’t pass near the sea. Instead, it passes through a wooded area and through vineyards and olive tree groves. It reaches 208m of altitude and then you will go down towards the next town. After more the an hour and half, you will be in Vernazza, before a landscape that will look like a painting. This village is considered by most of the tourists the most beautiful of Cinque Terre. Despite the huge amount of tourists, the village still maintains the essence of a seafaring town. The houses are gathered together around a small cove; all of them are dominated by the fortified walls and the tower of the castle. Vernazza is the only one of Cinque Terre to have a natural harbor. Take your time to admire this pearl, and maybe, stop to taste some of the local product in one of the characteristic caruggi. Go back, for the the last time, in the Sentiero Azzurro, in an other path away from the sea. Once you cross the mountains and gain altitude, you will be greeted by a breath-taking view of the port of Vernazza:it’s time to take some pictures! The path is about 3 km long and requires about 2 hours. Here you are, in the last stop of the itinerary! 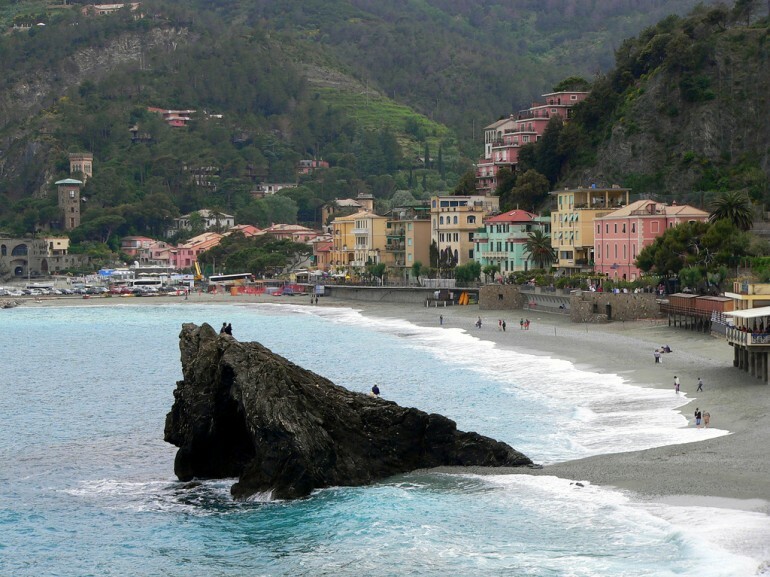 Monterosso is the biggest town of Cinque Terre and also the most visited one. A land loved by the Italian poet Eugenio Montale, this small town with its caruggi, boats, lemon trees and green hills is a Italian jewel. It’s divided in the new city and old city and it has several beaches, even sandy ones. To come back to the starting point of our itinerary, we suggests to take the train, in just 15 minutes you will be in Riomaggiore. Cinque terre is a place bound to stir up emotions, that should be visited at least once in a lifetime. An Unesco Heritage where men try their best to live in harmony with nature, forming unique, magical landscapes.